Sometimes the bad calls are in your favor and, other times, those unfortunate calls go against you. So what? Bad calls happen and there is nothing you can do about… or can you? A bad call may impact the game itself, but it doesn’t need to affect the way you play the game. In a recent NHL game, the Colorado Avalanche faced the Chicago Blackhawks. The Avalanche had a 3-1 lead with ten minutes remaining in the game when an unfortunate call went against Colorado. The Blackhawks scored on an obvious missed offside call, cutting into Colorado’s lead. Despite Colorado challenging the call, the officials upheld the goal. The Avalanche completely lost focus as well as their composure. Over the next three minutes, the Avalanche gave up three more goals. The lapse of focus by the Avalanche eventually cost them the game, losing by a 6-3 margin. Avalanche coach Jared Bednar was frustrated that his team lost focus which caused things to snowball out of control. Colorado defenseman Mark Barberio talked about how the Avalanche allowed the bad call to take the team mentally out of the game. When you are so focused on what you think is a bad call and adopt a “poor me attitude,” you focused is split between the past and the current shift. The game had less to do with the Blackhawks winning than it did the Avalanche losing, in particular, losing focus. You see, when you dwell on bad calls, those negative thoughts elicit strong negative emotions like anger or frustration. Now you have compounded the focus problem because you have two distractions pulling your focus away from the present moment. 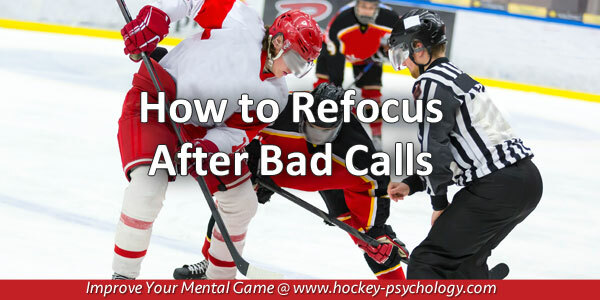 How can you focus after a bad call? You need to understand that some things are out of your control during a game. Unlucky bounces, bad calls and poor ice conditions will happen. If you can accept this fact, you will be one step closer to overcoming the focusing problem. Keep your emotions in check. Of course, you frustration after a bad call get to you if it leads to a goal against your team or an unjust penalty is called on you. But you must move past these emotions and regain your composure. It may be unfair but it is outside your control. Refocus and get your head back in the game quickly. Remember, you can overcome a lot of adversity by controlling your focus. After a bad call, you need something to help you snap out of it and get back to what you need to do now. One easy way is to use your self-talk to help you refocus. Tell yourself “NEXT!” Next shift, next play, or next possession. 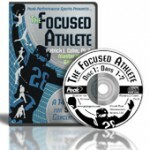 If you’re an athlete who is frequently distracted, loses focus in competition, or wants to learn more about how to focus better under pressure, The Focused Athlete is for you! Concentration and the ability to focus under adversity is what championship athletes do best. The Focused Athlete is a complete system to teach you how to focus like a champion and harness the power of a zone focus every tie you step on the playing field, court, track or course in practice and games! This workbook and CD program consists of 2 audio CDs that include 14 days of focus boosting exercises and a simple to follow workbook that guides you through each of the 14 days, helps you apply strategies, and customizes the exercises to your personal focus challenges. What are customers saying about our mental game program? 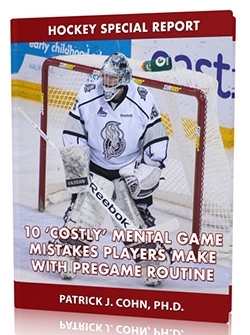 Free Hockey Mental Game Report! How your mind can be your best or worst asset on the ice. One strategy that can help you boost your pregame confidence. The top mental game skills you need to master to boost your confidence and performance in games and much more! What are sports parents and athletes saying about our mental game tips? Add More Value To Your Mental Training Programs! This workbook series was designed for coaches and mental coaches to use with their athletes. 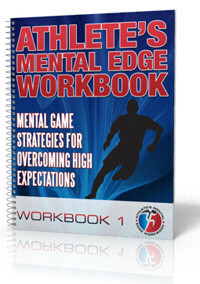 The Athlete’s Mental Edge workbooks complement your existing mental training program. Each of the 15 workbooks in the Athlete’s Mental Edge System teaches your athletes a specific mental skill to improve their performance. What are mental coaches saying about our mental training program? Do you want to learn how your athlete can benefit from mental coaching? Call or Email Us Today for a Free 15-Minute Sample Session. 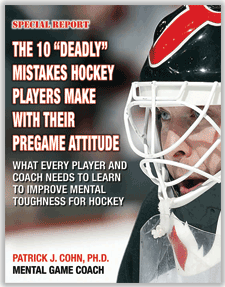 Do You Have Fragile Hockey Confidence?